CHICAGO – Antoine Fuqua’s “Olympus Has Fallen” (or “Die Hard in the White House”) is a stupid, exploitative movie that wants to be “Call of Duty: Black Ops” in film form but ends up more like one of its countless, ineffective rip-offs. There are moments of goofy, B-movie fun (certainly more of them than in the much-worse “A Good Day to Die Hard”) but not enough to get over the brutal nonsense that makes up most of this action flick. Extremely violent and insensitive given the attacks on Washington on 9/11, “Olympus Has Fallen” just isn’t as much as fun as the best “Die Hard” rip-offs and so it becomes just another loud, annoying wannabe. 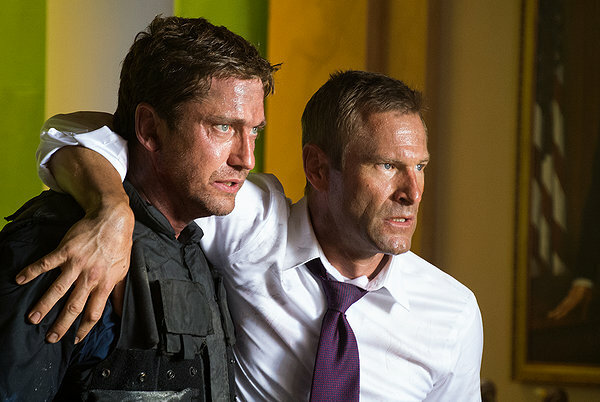 Secret Service Agent Mike Banning (Gerard Butler) is a loyal protector and friend not just to President Benjamin Asher (Aaron Eckhart) but his entire family, including son Connor (Finley Jacobsen). When a severely tragic event scars Banning, he’s forced to leave the President’s side and take a desk job in the Treasury Department. Trying to heal his emotional scars with the support of the lovely Leah (Radha Mitchell), Banning’s life is forever changed on the day that the United States is attacked in a way that makes what happened on 9/11 look like a warm-up. First, a plane armed with heavy machine guns sprays bullets into the National Mall in D.C. before destroying the Washington Monument in a sequence that should put a lot of viewers on edge. I’ll never forget the articles after 9/11 that suggested that the disaster would forever change the way we looked at action movies. Just over a decade later, a foreign plane is being crashed into a landmark in Washington, D.C. and innocent people are being sprayed with bullets in an escapist action film. I will say that most of the action is so over-the-top that no one can really take it seriously as exploitation but if you’re at all sensitive to that kind of thing, you may want to consider an alternate. It turns out that the chaos in D.C. has been organized with a very specific target in mind. The North Koreans are taking the White House. A heavily armed ground force takes the lawn, killing the White House guards and heading into the building. By having an agent on the inside, the nefarious terrorist Kang (Rick Yune) gets into the bunker with the President, Secretary of Defense (Melissa Leo), Vice President (Phil Austin), and a selection of other government employees for the writers to kill off in brutal ways. Kang and his team want to start World War III. Negotiating on the outside is the man now forced to be sitting President, Speaker of the House Trumbull (Morgan Freeman), Secret Service Director Lynn Jacobs (Angela Bassett), and General Edward Clegg (Robert Forster). And, of course, there’s Agent Banning who can save the world on his own. There are shoot-outs in “Olympus Has Fallen” that are undeniably well-choreographed. That’s impossible to deny. And Butler makes for an engaging lead, spurting out “Die Hard”-esque quips with more energy than Bruce Willis in his latest installment and handling the physical demands of the role with ease. Eckhart makes for a believably square-jawed Commander in Chief, Freeman is well-cast as the kind of leader we wish we had, and Bassett & Leo are simply too good for these parts, just reminding people how difficult it is for actresses of their age to get decent roles (Leo, in particular, is stunningly wasted given her recent Oscar win). The problem is that “Olympus Has Fallen” is total nonsense on a plot and dialogue level. I compared it to “Call of Duty: Black Ops” in the intro but in case you’re unfamiliar with those games, character and anything approaching believability are afterthoughts. I wouldn’t have minded if Fuqua and the team behind “Olympus” had gone for straight-up, B-movie silliness but then, judged on that level, the movie just isn’t fun enough. There aren’t nearly enough interesting set-pieces, the plot is surprisingly predictable (the one character who ends up being a traitor might as well have the word tattooed on his forehead), and, once again, that nagging sensation that entertainment based on a bloody, brutal attack on the White House that takes hundreds of innocent lives is kind of in bad taste. 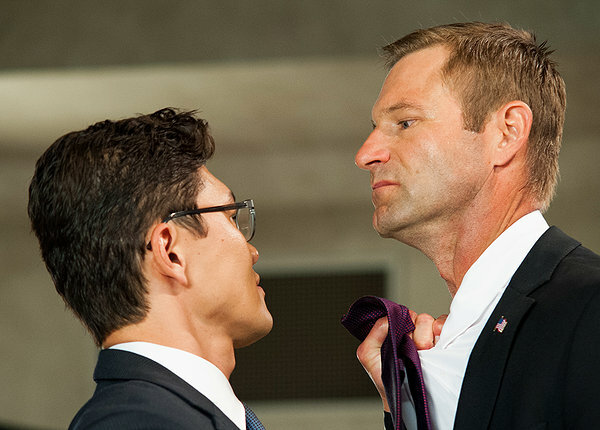 Ultimately, “Olympus Has Fallen” is more forgettable than horrendous. Fuqua knows how to stage an action movie and Butler knows how to lead one. The supporting cast is ridiculously strong with the two Oscar winners (Leo & Freeman) and great character actors like Forster and Cole Hauser. With all of the talented people involved, I kept wishing I was enjoying it more, trying to make excuses for it. I ran out of them before Agent Manning could save the day. ”Olympus Has Fallen” stars Gerard Butler, Aaron Eckhart, Dylan McDermott, Rick Yune, Morgan Freeman, Angela Bassett, Melissa Leo, and Radha Mitchell. It was written by Creighton Rothenberger & Katrin Benedikt and directed by Antoine Fuqua. It will be released on March 22, 2013 and is rated R.